Exceptional micro-market products and services delivered throughout Albuquerque. vending service in the workplace. 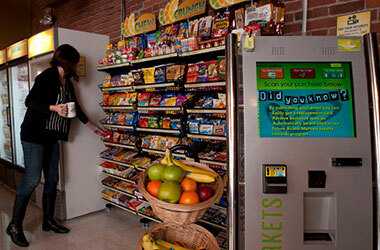 Expand the range of nutritious and delicious options beyond what is available in a vending machine with micro-markets. The fully-online self-checkout kiosk allows employees to purchase items from the micro-market whenever they need them. We install and stock the micro-market, at no cost to your Albuquerque company, keeping you free and refreshed to do more. The open racks and glass front coolers transform the old vending area into a mini store conveniently on-site for employees. 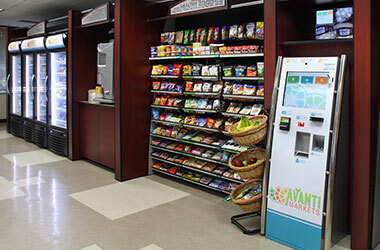 Adding a micro-market doesn’t just mean hundreds of additional food, snack and beverage items over vending machines, it also creates an open, welcoming feel. Employees love the variety of options, examining items before they buy, and using the self-checkout kiosk, all at no cost to you. A micro-market brings refreshment and commonly needed items directly to your workplace in eye-catching displays. Employees can grab a quick snack while working late or enjoy a fresh lunch during a working meeting, all without ever leaving the office. 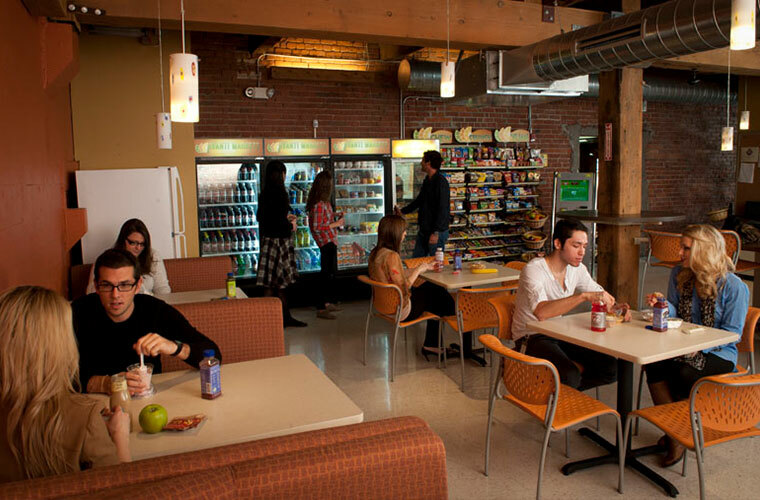 It allows 24 hour refreshment with quality snacks, fresh food, and drink options. 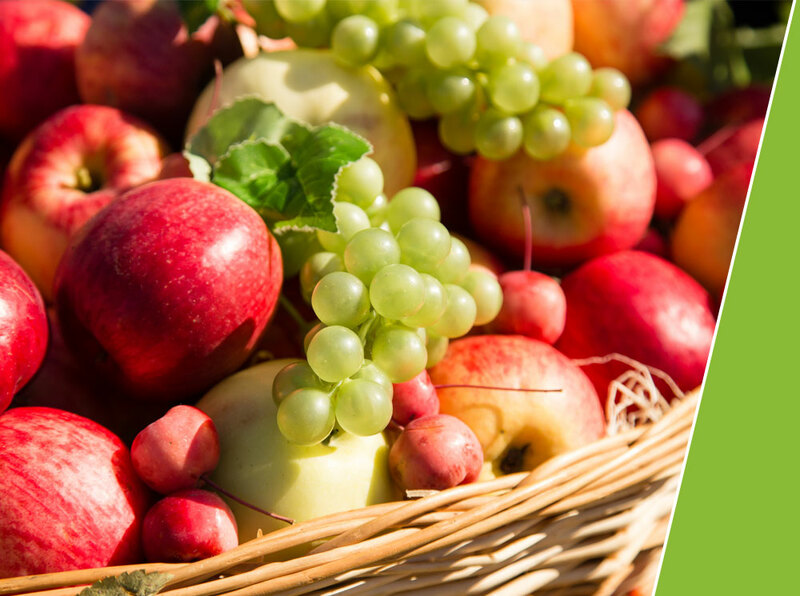 Finding convenient, healthy snacks, drinks and food in Albuquerque is important to employees -- a micro-market makes that easy. Micro-markets are the solution for Albuquerque companies looking to offer more benefits to employees, without adding cost. 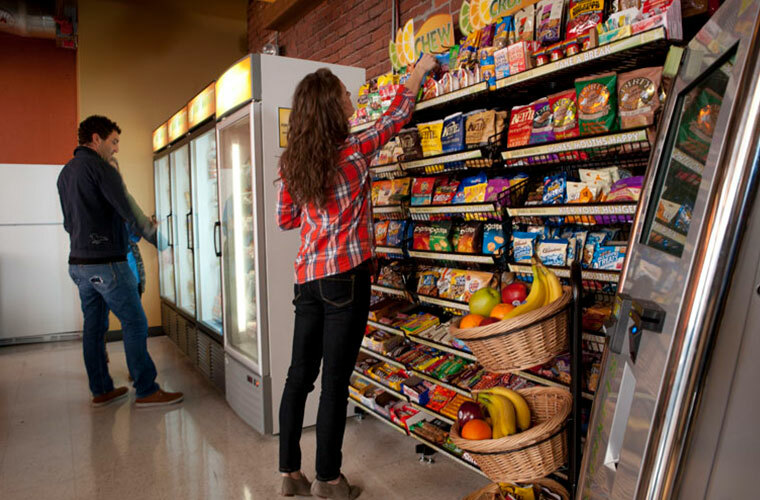 The open market concept completely transforms the old vending bank in the break room into retail quality racks and bright, open door coolers. There is space for hundreds of additional selections, including the fresh and healthy items so important in today’s workplace. 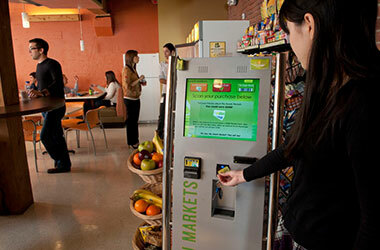 Employees can shop the market anytime and checkout at the secure, self-checkout kiosk using different forms of payment, including credit or debit card. We place and restock all products, making the micro-market a hassle-free, no cost solution that employees will perceive as a perk. See for yourself the versatility and benefits of Albuquerque’s must-have service. Break out of vending for more variety and an enhanced refreshment experience. 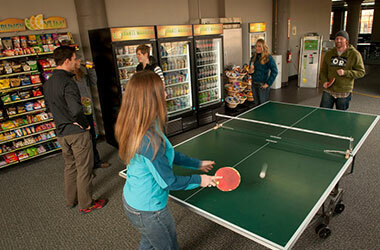 Find your perfect break room solution with Sandia Markets at 505.242.0102 or info@sandiaco.com.